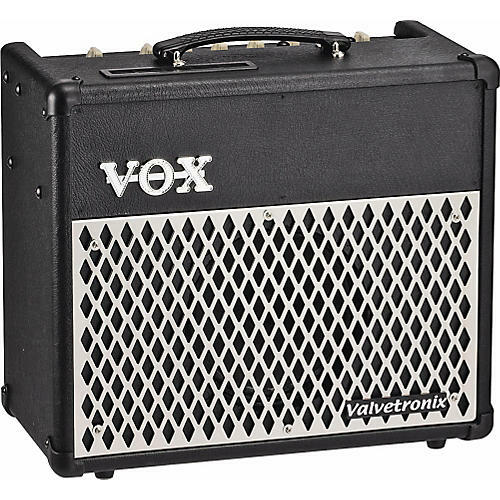 The Vox Valvetronix VT15 is a 15W combo amp that gives you 22 amp models ranging from the latest high-gain types to hard-to-find boutique and vintage amps. The Vox VT15 also boasts a full complement of effects, allowing it to cover the needs of a wide variety of styles and performance techniques. The VT15 amp also includes 66 preset programs, including 22 song programs that simulate the guitar sounds of famous guitarists. Now even beginners can start enjoying serious guitar sound right away. The VOX Valve Reactor circuit is the key factor that separates the Valvetronix amplifiers from other modeling amps. The 100% analog original power amp circuit actually has the same power amp circuit as a full-tube amp, using a 12AX7 miniature triode to reproduce a distinctive tube amp sound unattainable by digital technology. It replicates aspects that have an important influence on the sound of a tube amp, such as A/AB operation and the interaction of the power stage with the speaker.